Ever get annoyed when you plug your BlackBerry device in while in the middle of watching something, only to have the screen turn black and a big clock appear in your face? By default your BlackBerry device is set to display the clock when it is charging, so anytime a USB that is connected to a power source or computer is plugged in it will appear. 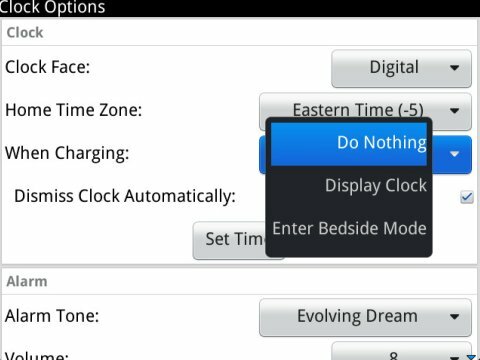 Luckily for you this can be changed to enable Bedside Mode or do nothing at all, and making the change is quite simple. That's it. Really. It is just that simple. No more clock popping up everytime you connect your device to a power source, instead you get to decide what it does.